The transformation of Southie was inevitable. Now, with upscale bars, trendy coffee houses, boutiques and luxury condos, South Boston is coming into its own as the up-and-coming place to live, play, and work. With a median single-family home price of $680,000 and condo price of $632,000, according to The Boston Globe, it's no secret that this is the perfect market for Boston area developers. 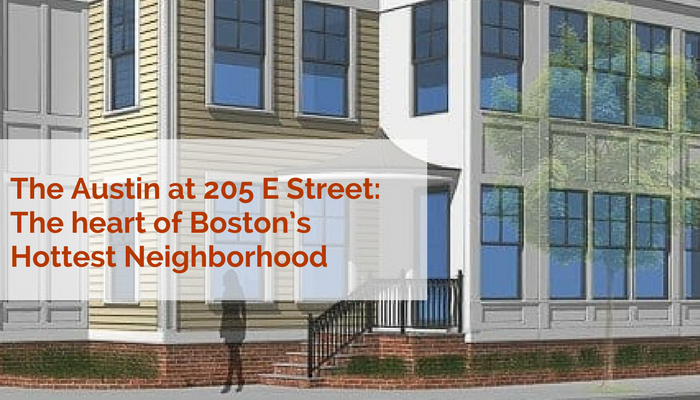 The latest addition is The Austin at 205 E Street, situated in the heart of Boston's hottest neighborhood. South Boston has been enjoying tremendous growth, especially with the addition of The Austin at 205 E Street, which is currently under construction and slated for completion this September. The Austin will be comprised of two three-story buildings, housing 34 luxury condos and 63 garage parking spaces. Choose from one-, two- and three-bedroom floor plans, each of which comes with two garage parking spaces. Prices per unit start at $699,000, with an estimated mortgage payment of $2,650 a month. Nestled on South Boston's West Side, The Austin is within walking distance to West Broadway's best eats, drinks, and shops. Plus, you're never far from all the major hubs of public transportation and the highway. Presented by Bromfield Development’s, The Austin was designed by Sousa Design Architects, with craftsmanship that precedes its time. You'll be hard pressed to find such a treasure elsewhere in South Boston or even Boston for that matter. This mid-rise building has units starting at $699,000 and going all the way up to $1,100,000, depending on the number of bedrooms and add-ons. E Street is just another booming neighborhood in Southie, which is located close to West Broadway, home to even more luxury condos that are popping up. From Fort Independence Park to Savin Hill Park, you'll find plenty of green spaces in this area, uncommon for such an urbanized neighborhood. Want to get into The Austin before construction is completed? Contact Elevated Realty at info@ElevatedBoston.com or call 617-701-6300 for more information. Or come down and see us at 174 Dorchester Street in Boston.